Tie rod ends provide connection between driven wheels and steering. 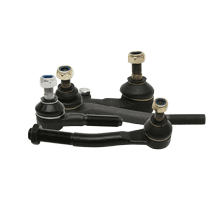 Like all steering parts, tie rod ends are important elements that affect on road safety. HOLA tie rod ends with spherical joints and sealed assembly polymer bearings are constructed according to principle of spherical joint. The most advanced materials and technologies are used for production of HOLA ™ tie rod ends. High quality is ensured by production automation and effective organization of quality control. Ball pins are made of alloy structural steel. Pins’ bearings are produced from high strength and wear resistant plastic. Tie rod end sealing is provided by neoprene protective covers which are fixed on body and pin by two ring springs. High quality lubricant based on lithium is filled during production on the factory and optimized for all tie rod end operating life. Manufacturing is organized in accordance with of ISO/TS 16949 requirements. Estimated operating life of HOLA™ tie rod ends is 75 000 km run*.